Never skip an opportunity to sift through the bargain bin at your local hobby shop. 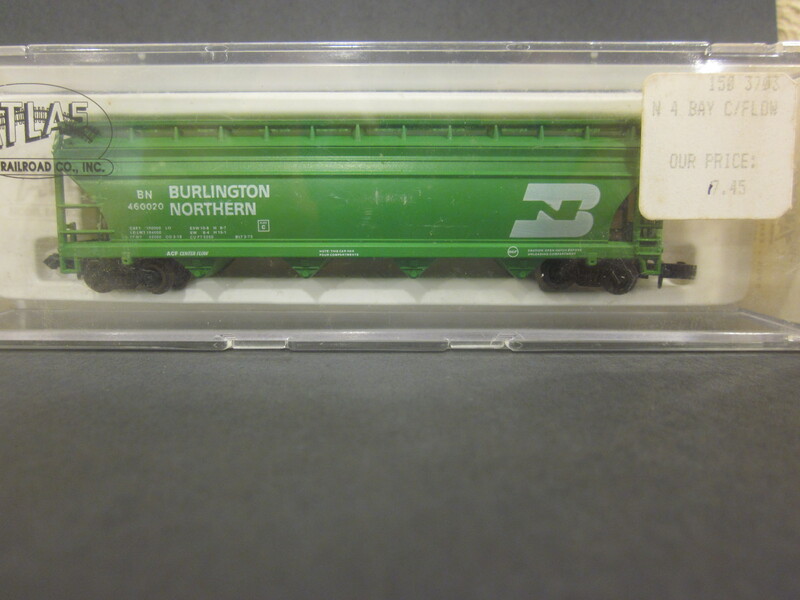 During recent visits to my train monger, I scooped up a pair of Roundhouse Apache Railway boxcars and an Atlas Burlington Northern covered hopper for the basement price of $2.50 apiece. Out of the box, the models weren’t worth much more than that. 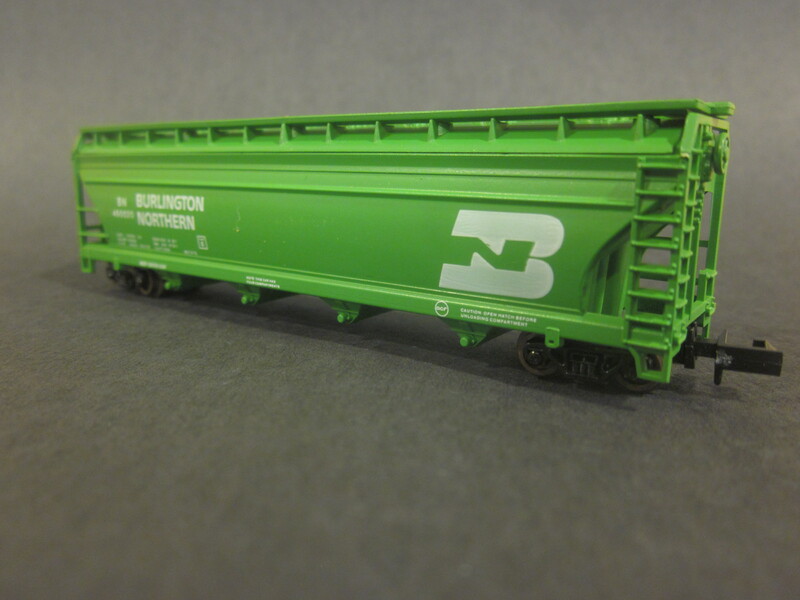 The lettering and finish were poor and the running gear was truck-mounted Rapido couplers and ancient plastic wheels. But we can fix all that. I removed the old trucks and discarded them, retaining the bolster pins. (I’ve found that older rolling stock doesn’t always accept new Micro-Trains pins.) I then gave the car a good spray of dullcoat to give the shiny finish a little tooth. 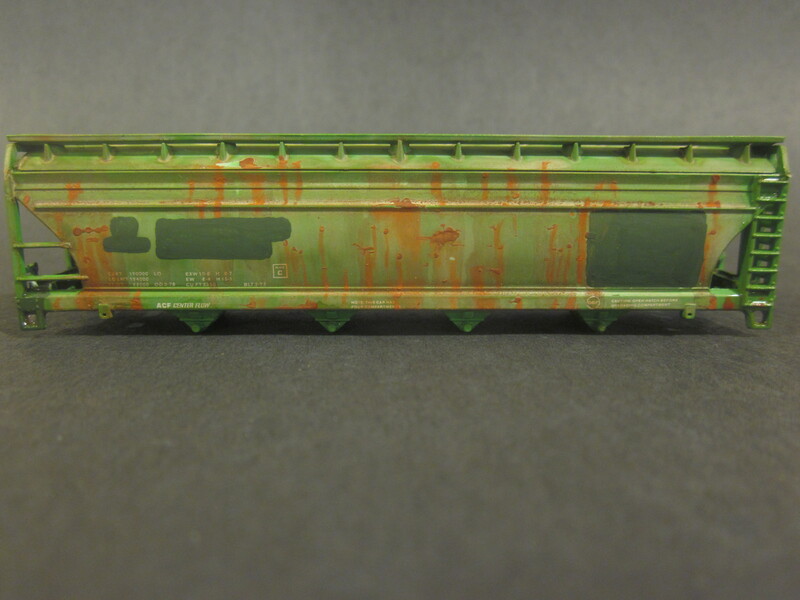 Using a toothpick dipped in burnt sienna paint, I dappled the sides and ends of the car with random rust spots. I then mixed some rust-colored weathering powder with a little rubbing alcohol to make a thin paste. With a fine brush, I drew streaks of the paste down from each rust spot. I then applied a wash of light rust-colored alcohol ink solution to the entire car. With careful downward strokes, I used the wash to soften the rust streaks without rubbing them out entirely. 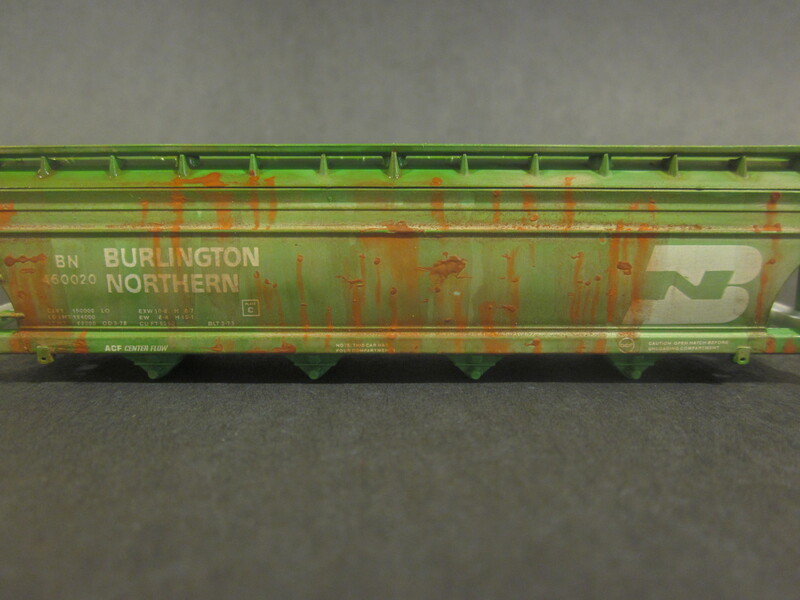 When the wash was dry, I patched out the Burlington Northern herald and reporting marks with dark-green paint. 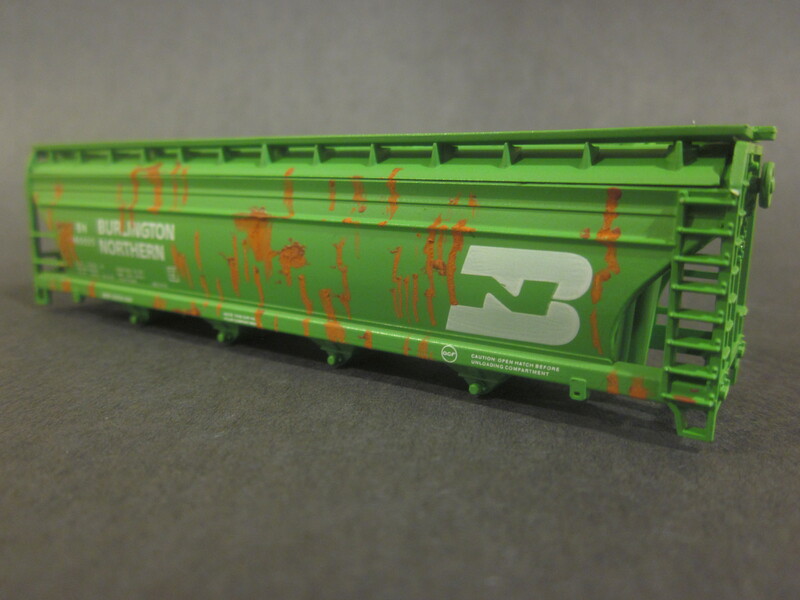 Some modelers suggest masking patch outs and spray painting them. I think the rounded corners and uneven edges of my brush painted patches better simulate the quick work of a guy in the car shop wielding a spray gun or roller. After the patches dried overnight, I added FCFL reporting marks and car number decals. I set the decals with Micro-Sol and let them dry. I then brushed a light coat of dullcoat over the decals to seal them. When that was dry, I coated the decals with my alcohol ink solution to knock down their bright white. When that dried, the dullcoat and alcohol ink had hazed up so I brushed another coat of dullcoat over the top. The several layers of dullcoat and weathering wash further enhance the spray-gun look of the patches, in my opinion. I outfitted the car with my standby Micro-Trains 100-ton roller bearing trucks and Fox Valley Models 36-inch metal wheelsets. 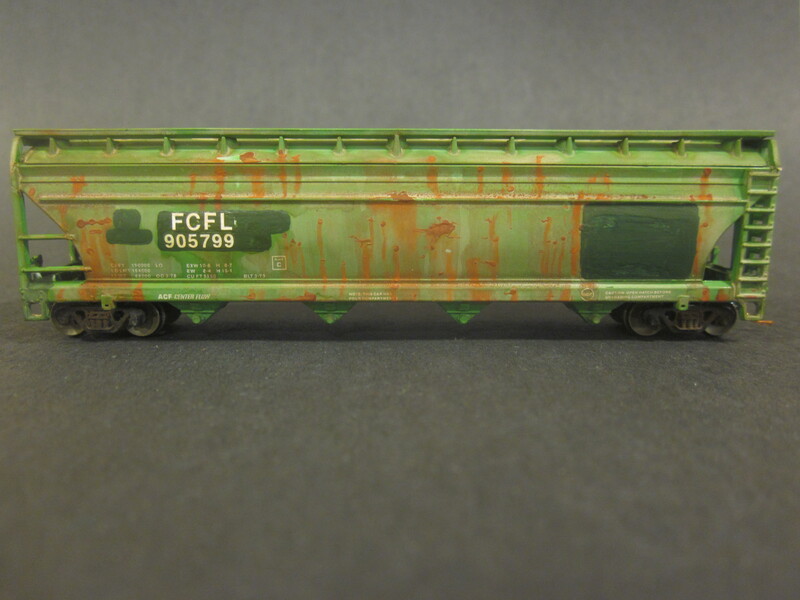 I weathered the trucks with powders and painted the wheels rail brown. There are some very beautiful, very expensive models on the market, but you can fill in your fleet nicely with pretty good, budget-friendly cars from the bargain bin.